Definition at line 29 of file UdsOp.h. Definition at line 19 of file UdsOp.cc. Definition at line 27 of file UdsOp.cc. References Comm::Connection::close(), conn_, debugs, HERE(), Comm::IsConnOpen(), and NULL. Referenced by Ipc::Strand::handleRegistrationResponse(), and timedout(). References address, COMM_DOBIND, comm_open_uds(), conn_, Comm::Connection::fd, Comm::IsConnOpen(), Must, NULL, options, and sockaddr_un::sun_path. Referenced by clearTimeout(), Ipc::Port::doListen(), Ipc::ImportFdIntoComm(), setTimeout(), timedout(), Ipc::UdsSender::write(), and Ipc::UdsSender::wrote(). Reimplemented in Adaptation::Icap::ModXact, ConnStateData, ClientHttpRequest, Adaptation::Icap::ServiceRep, Adaptation::Icap::Xaction, Security::PeerConnector, Adaptation::Ecap::XactionRep, Client, Http::Tunneler, Ipc::UdsSender, Adaptation::AccessCheck, Adaptation::Icap::Launcher, Downloader, Log::TcpLogger, Adaptation::Iterator, Comm::TcpAcceptor, Ipc::Forwarder, Ipc::Inquirer, Rock::HeaderUpdater, Mgr::StoreToCommWriter, Rock::Rebuild, PeerPoolMgr, Mgr::Inquirer, Server, Snmp::Inquirer, BodySink, Comm::ConnOpener, and Ipc::Port. Definition at line 96 of file AsyncJob.cc. 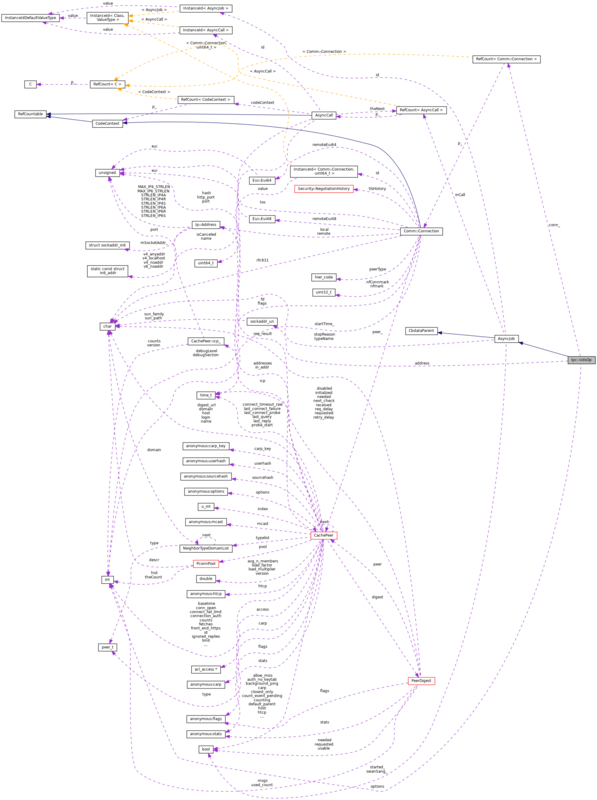 Referenced by AsyncJob::done(), BodySink::doneAll(), Comm::ConnOpener::doneAll(), Server::doneAll(), PeerPoolMgr::doneAll(), Rock::Rebuild::doneAll(), Rock::HeaderUpdater::doneAll(), Comm::TcpAcceptor::doneAll(), Adaptation::Iterator::doneAll(), Log::TcpLogger::doneAll(), Downloader::doneAll(), Adaptation::Icap::Launcher::doneAll(), Ipc::UdsSender::doneAll(), Adaptation::Ecap::XactionRep::doneAll(), Client::doneAll(), Security::PeerConnector::doneAll(), Adaptation::Icap::Xaction::doneAll(), Adaptation::Icap::ServiceRep::doneAll(), ClientHttpRequest::doneAll(), and ConnStateData::doneAll(). Definition at line 67 of file UdsOp.cc. Referenced by setTimeout(), and timedout(). Referenced by Ipc::Port::Port(), and timedout(). References asyncCall(), commSetConnTimeout(), conn(), handler(), and noteTimeout(). 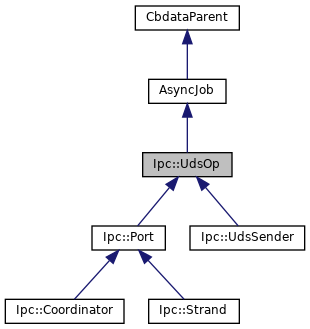 Referenced by Ipc::Strand::registerSelf(), Ipc::UdsSender::start(), and timedout(). Reimplemented in ConnStateData, Adaptation::Icap::ModXact, Ftp::Client, Ftp::Gateway, Ftp::Server, HttpStateData, Security::PeerConnector, Adaptation::Ecap::XactionRep, Http::Tunneler, Ipc::UdsSender, Adaptation::AccessCheck, Adaptation::Icap::Launcher, Downloader, Adaptation::Icap::Xaction, Ftp::Relay, Log::TcpLogger, Adaptation::Iterator, Comm::TcpAcceptor, Ipc::Coordinator, Ipc::Forwarder, Comm::ConnOpener, Ipc::Inquirer, Http::One::Server, Rock::HeaderUpdater, Mgr::StoreToCommWriter, Rock::Rebuild, Mgr::Inquirer, PeerPoolMgr, Server, Snmp::Inquirer, Ipc::Strand, Adaptation::Icap::OptXact, Ipc::Port, Mgr::ActionWriter, and Mgr::Filler. Definition at line 43 of file AsyncJob.cc. Referenced by Ipc::Port::start(), PeerPoolMgr::start(), AsyncJob::Start(), Adaptation::Iterator::start(), Adaptation::Icap::Xaction::start(), Adaptation::Icap::Launcher::start(), Adaptation::AccessCheck::start(), Ipc::UdsSender::start(), Http::Tunneler::start(), Security::PeerConnector::start(), and ConnStateData::start(). References clearTimeout(), conn(), noteTimeout(), p, setOptions(), and setTimeout(). Referenced by conn(), and Ipc::UdsSender::UdsSender(). Definition at line 55 of file UdsOp.h. Referenced by conn(), and ~UdsOp(). Definition at line 54 of file UdsOp.h. Referenced by conn(), and setOptions().